I was about five years old when my family moved to a new house in a neighborhood under construction. Big trucks and heavy machinery roared up and down our street every day for months, churning the unpaved road into a mucky mess. One day I donned my rubber boots and attempted to cross the street. 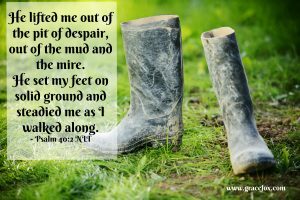 It didn’t go well: the mud swallowed my feet. Try as I might, I could not break loose from its suction-cup hold. Thank goodness for the kind neighbor who heard my cries for help and rescued me. As I prepared for a recent speaking engagement, I thought a lot about muck of another type—negative thinking and sinful behaviors. How easily we can become stuck in them, and they become strongholds. Unless we deal with them, they impact our mental, emotional, spiritual, and physical well-being. Inevitably they affect our relationships too. What might be some examples? Heaven forbid we fall short of excellence in all we do and say because that would most certainly disappoint everyone around us and make us look like failures. Or so we think. We also expect the same from others lest their imperfections somehow reflect poorly on us, and so we become critical or judgmental of their efforts. Nothing they do is good enough. Many of our negative behaviors are rooted in fear—the fear of rejection, of failure, and of inadequacy, for starters. It turns us into control freaks, or makes us possessive over the people in our lives and the things we own. We might miss wonderful new opportunities, or we may get involved in an unhealthy relationship—all because of fear. “I’m not good enough.” I’d be a very wealthy woman if I had a dime for every woman who struggles with this stronghold. It often begins when we’re children, through both spoken and unspoken messages from adults in our lives. Perhaps we’ve been compared to an older sibling who’s smarter or better behaved, been overlooked by parents because they were work-absorbed or wrestling with their own issues, or been the child of an absentee parent. Our wrong thinking tells us that if we were “good enough,” our parents (or other significant adults) would have been pleased with us and wanted to be with us and protect us. But that didn’t happen, therefore we must be flawed and unlovable. The enemy of our souls wants us to be anything but free and joy-filled, so he plants these lies in our minds. Often we don’t even recognize their presence until we hit a crisis. Thank goodness God rushes to our rescue when we call to Him for help! When we’re honest with Him and with trusted godly friends about our situation, He sets to work, freeing us from these strongholds. God redeems and transforms us. And that transformation speaks volumes and brings hope to those who know us. “Many will see what he has done and be astounded. They will put their trust in the LORD” (Psalm 40:3). What other strongholds would you add to those I’ve listed? Who or What is Your Stronghold?